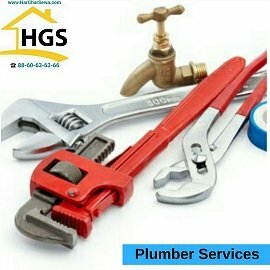 Any kind of hindrance in plumber fitting, such as a clogged pipe, running toilet, broken pipe, leaking tap etc. can create a lot of nuisance in your lives and thats when you contact Har Ghar Sewa. Any kind of plumbing service you need, Har Ghar Sewa is always there to help you. Installation Nad removal of Water tanks etc. An overall inspection will be done by the plumber and the pricing will be told after the inspection of the damaged area. When you are looking forward for the best quality plumbers at you service, Har Ghar Sewa has got your back. We offer city’s best possible repairing staff for maximum satisfaction of our customers at best possible rates. You get proffessional and experienced staff to provide you the service. To ensure that there are no frauds, our service providers will have an i-card of Har Ghar Sewa and a standard tool kit with them.